The action thriller Free Fire, winner of the People’s Choice Award for Midnight Madness at the Toronto International Film Festival, is executive produced by the great Martin Scorsese and directed and co-written by Ben Wheatley (High Rise). 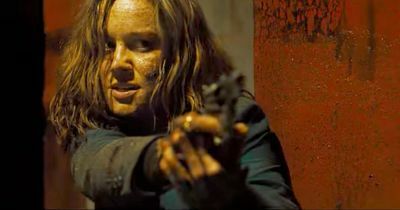 Set in 1970s Boston, the film opens with Justine (Brie Larson, Room), a mysterious American businesswoman, and her wise-cracking associate Ord (Armie Hammer, J. Edgar) arranging a black-market weapons deal in a deserted warehouse between IRA arms buyer Chris (Cillian Murphy, Anthropoid) and shifty South African gunrunner Vernon (Sharlto Copley, Chappie). What starts as a polite if uneasy exchange soon goes south when tensions escalate and shots are fired, quickly leading to a full-on battle royale where it’s every man (and woman) for themselves! This flick about an arms deal that goes very, very wrong, featuring all-new bonus content, including an audio commentary with co-writer/director Wheatley and a featurette that looks at the making of the film.